Tackle your fitness goals and experience a low impact, full body workout with the SF-RW5801 Synergy Power Motion Magnetic Rowing Machine by Sunny Health and Fitness. Engage your quads as you propel your legs back and forth on the ergonomic pivoting foot pedals. The oversized foot pedals move forward and backward with your feet to promote a powerful push that is sure to fire up those leg muscles. Grasp the foam padded handlebar and begin your rowing workout. 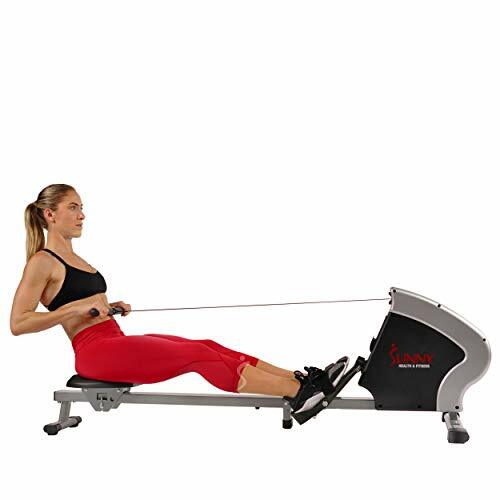 Crank up to 8 levels of magnetic resistance creating smooth and silent rows each time you pull. The large, sweat-resistant seat supports you during long exercise sessions keeping you comfortable and focused. The sturdy slide rail and frame support up to 285 LBS. 43 inches of slide rail length provides ample room to extend and retract your legs promoting form and efficiency for each row. Progress is key to keeping you motivated. Check out all your fitness stats on the easy to read monitor displaying time, speed, count, calories burned, total count and count per minute. The tablet holder lets you safely place your mobile device on the screen and follow along your favorite video. The folding rowing machine measure at 72L X 22W X 23H inches and 32L x 22W x 47H inches when folded upright. Rubber end caps adjust to floor for stability while protecting possible scratches to floors. Achieve an incredible low impact cardiovascular exercise routine right at home with the SPM Magnetic Rowing Machine by Sunny Health and Fitness. If you have any questions about this product by Sunny Health & Fitness, contact us by completing and submitting the form below. If you are looking for a specif part number, please include it with your message.